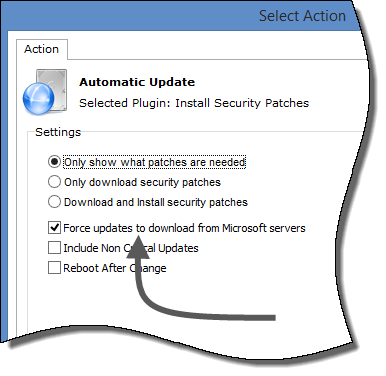 Almost two years ago we came out with a Network Administrator plugin that could force MS automatic updates – remotely. After that release, one of the things we found is people needed it because of a botched WSUS (Windows Server Update Services) setup. When I say botched, it is pointing to the wrong IP address for updates. We updated the plugin to force it to download from Microsoft’s servers. That created a new problem – people wanted to force updates on a machine with a working WSUS server. They don’t want it to download from Microsoft. If you tell it to download from Microsoft, it will ignore group policy settings and download from Microsoft. Otherwise it will follow the policy put in place by your WSUS server. If it is already installed, just close it and install right over. This will update the plugin for you automatically.